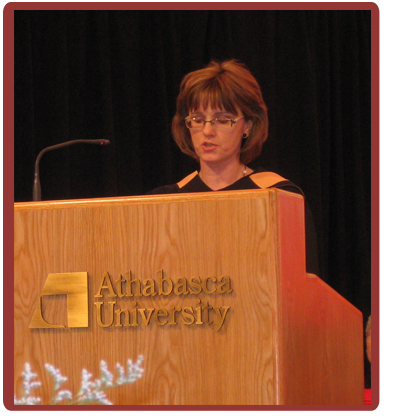 Melissa Mountain graduated from Athabasca University this spring with her Master of Counselling degree. 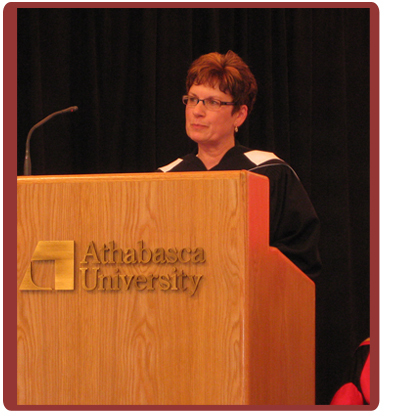 This address was given on Friday, June 7, 2013, as part of the Athabasca University Convocation ceremonies. We are here today to celebrate the completion of our academic programs and the conferring of our degrees. Although we have come from many different locations and for many different reasons we all chose to attend Athabasca University programs. 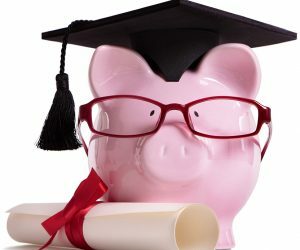 When I initially spoke of my plans to pursue an online distance education program I was met with support but I also received comments such as; ?Does anyone ever finish those programs? ?, ?Why would you want to go to school alone? ?, ?Better you than me ? I’d never have the discipline.? And, of course, the ?How could you? – life is too busy already.? Athabasca University’s approach to post secondary education, and OUR success, proves that students do finish, that online learning is accessible and effective, and dare I say, even enjoyable. When I humbly accepted the invitation to deliver today’s graduation address my husband noted that I was giving up my favourite parts of a distance program. That today I could not just sit behind my computer in my basement home office. Today I would have to arrive at a set place, at a set time, wearing something other than sweatpants, and I’d have to verbalize my thoughts not just type and spell check! That being said I would still not miss the opportunity to speak before you today. 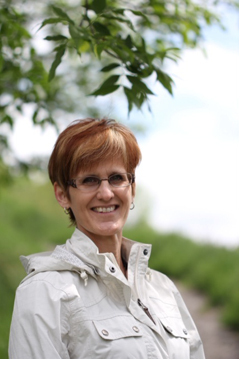 For me, choosing Athabasca University’s Master of Counselling program was an obvious choice. 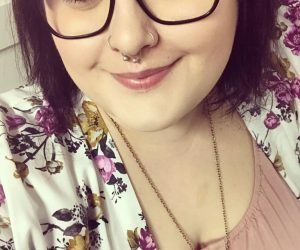 Athabasca’s partnership with the Vancouver Art Therapy Institute meant that I could pursue both my Masters of Counselling and an Art Therapist designation. Although not everyone is looking for such a specialized program (there were only four students in my cohort), Athabasca’s partnerships with many other institutions and organizations embodies the larger world we live in. Partnerships, shared ventures, and global connections are the norm for many professions. Placing students within a connected global arena at the onset of our learning prepares us for the expectations and realities of our future professions. Distance learning eliminates the barriers of geography and class-time commitments. Online technology opens the doors for shared resources and seamless communication across time zones and land masses. As students, with barriers eliminated and access opened, the rest was simply up to us. Just when we thought it may still be too overwhelming to continue we met our teaching assistants and our professors. Athabasca’s teaching assistants and professors are not the usual brand of talking heads at the front of an overcrowded lecture hall. 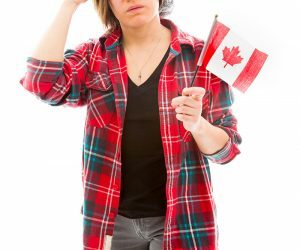 Athabasca professors have the ability to, literally, read between the lines of our posts, to craft challenging, yet supportive and respectful, replies, and to help us bring forth our best, all without the aid of non-verbal cues or communication. How our professors knew when we needed a cheerful call or a smiley emoticon we’ll never know! Our assignments, group projects, papers, and exams required us not only to study but also to manage our life schedules, to juggle our priorities, to humbly accept help, to push ourselves, and to forgive ourselves. To our TA’s and our professors, thank you for your support, wisdom, and your smiley faces. 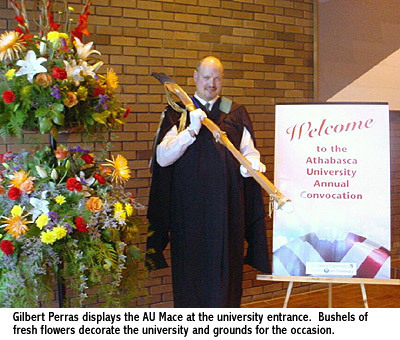 Behind the scenes, many other Athabasca university personnel ensured our success. For some of us the staff in the tech department became our new best friends. Faculty administrators, librarians, researchers, the Deans of our faculties, and the students’ unions all played a role as well. We have our TA’s and our professors to thank for helping us through the course curriculums. We have our classmates to thank for helping us through, well? just about everything else. Today may be the first time you have seen each other but it is certainly not the first time you have connected with each other. 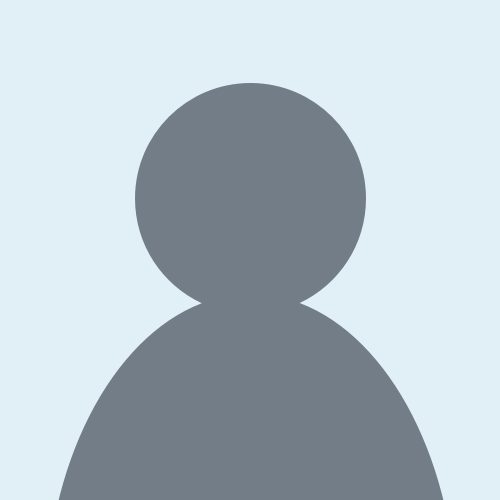 The perception that distance learning is impersonal or isolating is quite incorrect. Think of the time when a classmate’s post helped you better understand the week’s lessons, take a new perspective, or even just feel less alone in trying to the meet the demands of school, work, and home. The shared dialogue between us created meaning and wisdom beyond the textbook knowledge and maintained our humanness throughout this stressful endeavour. Within my program my classmates came from Alberta, Ontario, British Columbia, Japan, the Maritimes, Australia and, yes, even Saskatchewan. There were addiction counsellors, teachers, nurses, classroom aides and even a neuroscientist. Initially, we were just small pictures at the sides of a post, as the courses progressed we became supports, confidants, and colleagues. Nothing warms your heart at 1 o? clock in the morning like seeing that one of your classmates is posting right alongside you. We saw each other fit class work in between employment demands, soccer lessons, and swim classes, as well as weddings, family holidays, and sadly, even a funeral. As I hope you have, not only did I gain an education I have gained lifelong friends. To our classmates turned friends thanks for being you and for accepting us. Beyond our Athabasca community we had many other supports, although we sat alone at our computers this was far from a solo endeavour. To our moms, dads, spouses, sisters, brothers, and our own children, thank you for understanding. You inspired us to work hard on our own goals and forgave us when we couldn’t work hard on your goals. Without your care and support we would not have discovered what we could accomplish or who we could become. Graduates, just as Athabasca University became a leader in distance education; you have become role models and leaders as well. As Athabasca graduates you have joined the community of successful online learners as well the growing community of Athabasca Alumni. You are role models for your classmates, your families, and your communities. You now have the ability to use your expertise and education to become leaders in your workplaces and chosen professions, enriching the lives of others as your Athabasca university experience enriched your life. Congratulations Graduates: Savour today’s celebrations, lead from wherever you stand, and remember you CAN achieve your goals. Thank you.